A link-a-dink-a-doo for link-a-dink-a-you over at CatholicMom.com! I am crazy behind in letting the world know that I had an interview post last week (I know, LAST WEEK!) over at Our Hearts Are Restless. Thank you to the lovely hostess for having me over! The Working Mother Interview Project seems to have been a lovely success! Thank you to all my interviewees for sharing their experiences. I learned a lot from you: mostly that we are all united by a wish that someone would just help us with the housework. I’m making slow, painful headway with the sequel to Don’t You Forget About Me. I have had to do some heavy reading for research. I’ve gotten so scared about where the story line for this one is going that I’ve stopped myself from writing so many times along this way that I’ve lost count. See, let me tell you a story. 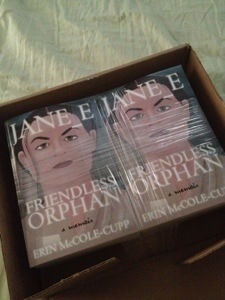 In August of 2001, I was drafting my first novel, Jane_E, Friendless Orphan: A Memoir. Not to spoil too much, but that August I wrote a chapter that included a side plot of bioterrorism. Did you check the timeline there? August 2001? I am pretty sure I gave that chapter to my critique group in the first week of September 2001. We met again around the time of the “Amerithrax Attacks.” I was horrified that something had come out of my imagination that ended up being in the vein of others had actually done. It’s one thing imagining The Bad Guys and their Evil Ways and putting them in a fictional world where they can be discovered, defeated, and everything turns out more or less okay–changed forever, but okay. It’s something else to see it happen–only without the guaranteed Good Guys. Rationally I know that I had nothing to do with Tom Brokaw needing a script for Cipro. Rationally I know that there are not enough people reading my books that anyone is likely to get “ideas” from even the darkest thing I could possibly write. On top of that, the people buying books like mine are probably not plotting plots or scheming schemes. And I’m still scared that I imagine such things. I imagine them in a world of good people who fight the bad, but I still imagine them. You’re probably asking, “Okay, so what’s the success here?” I’m asking the same question. I guess the success is that I (a) saw the thought-shattering humility in seeing that I am just as much a sinner as a terrorist, and that none of us is beyond God’s mercy, so that’s Good News, and (b) That reminder of my own frail humanity was enough to get me to reach out to three writers (two friends, one complete stranger from whom I expect to hear nothing, but that’s okay) asking for advice and prayers. In the midst of all this, I had occasion to look up the word “poop” in the thesaurus. God has a sense of humor. Next time we get to talk, I’m telling you the story of my parents’ plane trip home from Georgia just before 9/11 and the freaky encounter they had with a fellow passenger. I really enjoyed reading the Working Mother interviews. It was fun to see the common theme of wanting help with housework. I don’t think I said that in my interview, but I wholeheartedly concur! I was excited to participate too and I got to add a new blog to my Feedly to follow. Thanks, Erin!